The sky was blue and punctuated with mounds of fluffy white clouds. The air was crisp, not too humid, and full of promise. It was June 13, 2003, a Friday, and I was playing hooky from work. Nancy and I were spending the afternoon attending the Pittsburgh Three Rivers Arts Festival. where we met the artist Wolff in his booth of art things for sale. We liked a few of his paintings, and told him so. His booth was quite busy so we decided to wander about and return later. The festival and the day beckoned and we enjoyed ourselves immensely. It had only been a few months since Nancy and I had met, and the infrequent visits meant that a longing would build up that consumed our every moment together. It must have been obvious to Wolff when we returned to his booth later that afternoon. He engaged us in conversation, asking about our relationship, and taking an interest in our bourgeoning love. We told him of our long-distance relationship, of our electronic meeting, the many long nights on the phone, and the sea of miles between our cities. We decided on a particular painting, and as he was ringing it was brought to his attention that the painting was as of yet untitled. 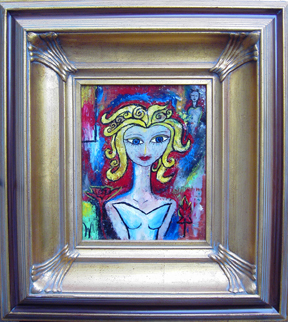 He knew that Nancy was from Chicago, and since the picture was of a young lady, he titled it Princess of Chicago. And two years later the Princess is now an ambassador to our house in Pittsburgh. Please click here or on the picture to return to the jump page.